So much more to do! Well, it’s two days in. I had a LAN with some friends last night so I didn’t get much done then. Things are moving slow but steadily at the moment. I’m already beginning to simplify my plans because the original idea is likely going to be a bit hard to reach given the time left. The Idea: Manage a gang of miscreants and take over the city by destroying the kingpin of the current top dog. The Reality: It’s likely going to be a very simple game indeed but if I like the direction it’s going I may work on it further after the contest. No promises though because I tend to be very lazy indeed! I’ve redone the physics engine for the game using vector-based movement. This has resulted in a lot smoother movement (especially jumping) and should make implementing newer physics interactions a lot easier for the future. 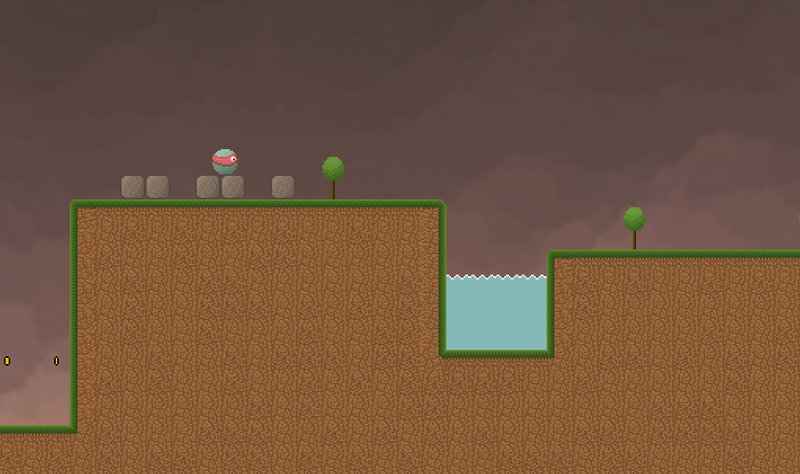 I’ve also added water pools into the level generation (although the physics aren’t anywhere near perfect for swimming yet) and one-way platforms that you can jump through from the bottom but land and stand on top of. So far progress is slow but steady. Tomorrow’s plan it to implement version 1.0 of the “icecap/snowy” biome graphics. 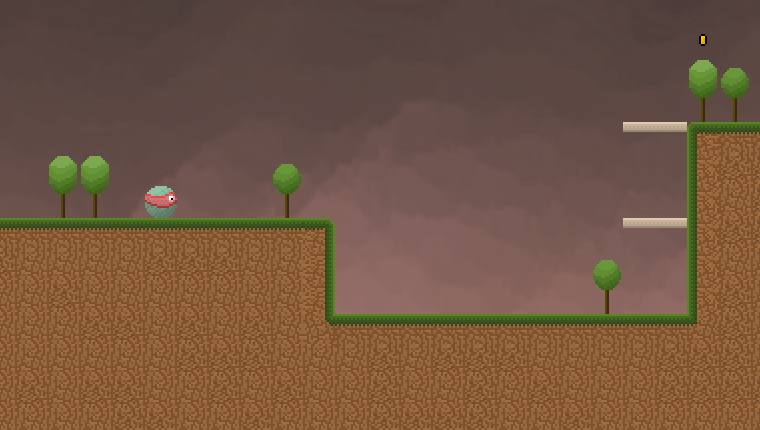 Then I’ll probably work on adding some background graphical fluff to each distinct biome. Future goals for the next two weeks are sloped terrain and moving platforms. These are both features the older engine did not have so I’ll be embarking into new territory in that regard. I don’t expect moving platforms to be too much of an issue but I fully expect sloped terrain to put up a fight. A screenshot showing off the forest biome. The idea is that the map will have 4 distinct biomes based on the height the player scales or descends to. The lowest will be the desert biome with palm trees and cacti and other spiky things. Second up is the cliff/rocky biome with boulders that can crush you and lava pools. Thirdly will be the forest biome shown here and lastly the icy peaks at the very top. These biomes are subject (and likely) to change but it’s the idea I’m going with for now. Each biome with be equally difficult but the difficulty will increase based on the distance the player survives in the X axis direction. Therefore biome = unique threats but of scaling diffulty. Some games will start out in the icy peaks and linger there for awhile while others may start in the rocky cliffs. Just been fooling around more with Java and Slick, and decided to recreate a clone of one of my favorite arcade games, Bomberman! Also, in case anyone is following my posts, most of these projects are just experimentations, so don’t expect a finished version 🙂 I’ve been learning slowly and making mini projects to apply some of the knowledge.